I know today isn't the 4th of July, but it's time to get some ideas! I'm participating in a fun Patriotic Blog Hop! Follow the link at the end of my post to go to the next lunch. Then click the link at the end of that lunch and so on to follow the Hop! This lunch took it's toll on me. It all started with the Jello. It wasn't cooperating so I gave up on it, promptly dropped an entire container of blackberries on the floor, stepped in said blackberries, and then smacked myself in the face with an ELB lid. Hard. Lunch making is dangerous, yo. 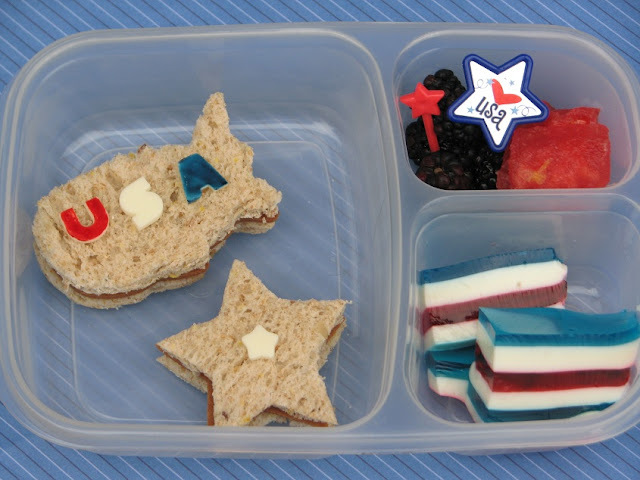 Kidlet has USA and star soy ham sandwiches. On the side are blackberries, watermelon, and layered Jello. I *LOVE* the jello! And I know what a labor of love it was for you to make :) The colors turned out fabulous!! you were right...your jello is epic! The layered jello was worth it! :) Love it!!! Your perseverance paid off, this lunch looks wonderful! Love, love, love the jello! AWESOME JELLO!!!!!! You did it! WE love your layered jello. I never have accomplished that in my entire life. A must try. That is some seriously perfect layered jello.. JEALOUS! Great lunch!! Your jello turned out AMAZING! What are you talking about? The whole things is very well done & colorful. Love it! I LOVE the layered jello!!!! great lunch! The jello turned out gorgeous! I love your jello, it's fabulous even if it didn't cooperate! That jello was worth all the hard work! It looks amazing and it was epic! What a fun great lunch! Love it! Especially the jello layer! Thanks for linking it up at Bento Blog Network!